Humeral fractures occur commonly with up to five percent of all fractures falling into this category, eighty percent of humeral fractures being minimally displaced or undisplaced. Osteoporosis is a contributing factor in many of these fractures and a fracture of the forearm on the same side is a typical presentation. Nerve or arterial damage from the fracture is an important consideration but not common. Typical sites of fractures are the top of the arm (neck of humerus - "shoulder fracture") and the middle of the shaft of the humerus. The usual cause of a humeral fracture is a direct fall on the arm, either on the hand, elbow or directly onto the shoulder itself. Due to all the muscles that attach to the upper humerus, there can be a lot of muscular force at the time, dictating how much the bones are pulled into a displaced position. Humeral fractures are more common in the elderly with an average age of fracture of around 65 years and younger people usually have a history of forceful trauma such as motor accidents or sport. If the fracture occurred without significant force then a pathological cause such as cancer must be suspected. 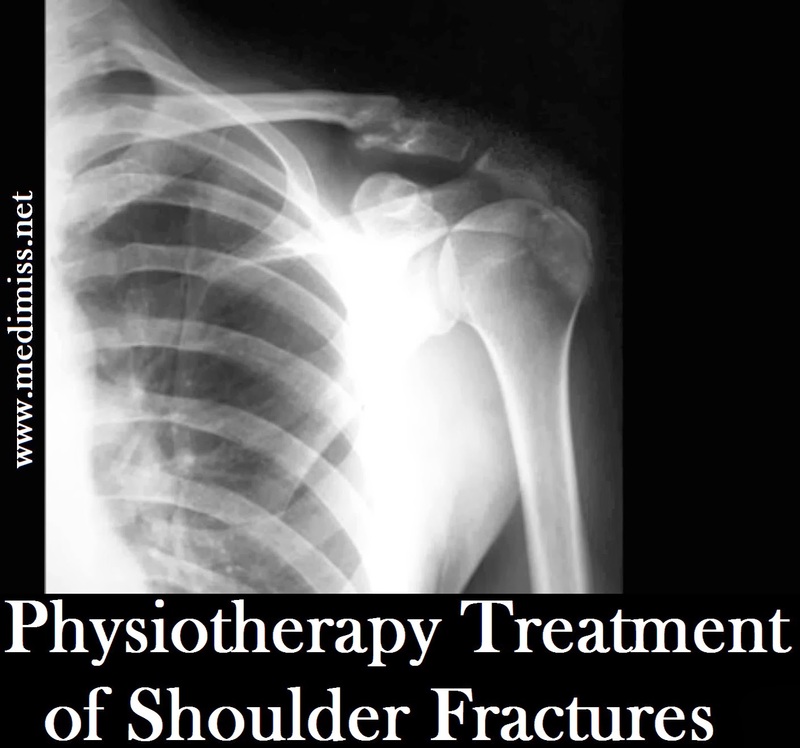 On physio examination pain will occur on movement of the shoulder or the elbow, there may be extensive bruising and swelling, the arm may appear short if the fracture is displaced in shaft fractures and there is very restricted shoulder movement. Radial nerve damage is rare in upper humeral fractures but more common in fractures of the shaft, leading to "wrist drop", weakness of the wrist and finger extensors and some thumb movements. After the fracture the patient's movements are kept restricted and sufficient analgesia provided to keep them comfortable. With little or no displacement the management is non-operative but if the greater tuberosity is fractured then it is important to suspect rotator cuff injury. This is more common in injuries with high forces, when the patient is older or the tuberosity is displaced significantly. Humeral neck fractures can be kept in line with a collar and cuff, allowing the elbow to hang free, while shaft fractures are difficult to manage but can be braced. Open reduction internal fixation (ORIF) is often performed for displaced fractures with three or four fragments and more commonly in younger patients, while older patients have humeral head replacement to prevent pain and stiffness in the shoulder. Nailing or plating is used in shaft fractures if necessary but these usually heal without surgery. Humeral fractures can have complications including injury to the radial nerve in shaft fractures, frozen shoulder and death of the humeral head due to loss of blood supply. 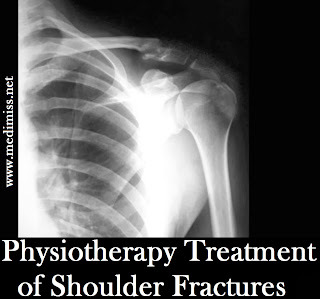 Although normal healing time is 6-8 weeks, older sufferers may never re-establish normal range of shoulder movement. Initially the physio assesses the arm, asking the patient about their pain level as this varies greatly, examining the swelling and bruising of the arm. The physiotherapist then checks the available range of movement of the shoulder, elbow, forearm and hand. Any muscle weakness and sensory loss is noted as this may denote nerve damage. If not operated on, a sling is continued with and if the fracture is not too painful or severe, early exercises are started by the physiotherapist. Pendular exercises, with the patient bending over at the waist, are important in the early stages as they allow movement of the shoulder joint without much force. Three weeks after the fracture bone healing will be well under way so the physiotherapist will instruct the patient in auto-assisted exercises, using the other arm, to help reduce stress on the injury. Unassisted exercises are the next step as the arm becomes stronger, to practice lateral and medial rotation and flexion. At six weeks the bone will be clinically sound so the physio can progress to more vigorous movements with resistance and gentle end-range stretching. Joint mobilisations can be useful to free up the sliding and gliding movements of the joint and strengthening and joint range work continued with Theraband.